Founded in 1951, The Bow Group is the oldest conservative think tank in the United Kingdom run by a group of volunteers. It holds no corporate view, and is thus open to all strands of conservative thought. Although often associated with the Conservative Party, the group is an independent organisation funded largely by members' subscriptions. The Bow Group exists to publish and promote the research and policy proposals of its members, through policy papers, policy briefs and larger collaborative projects. Its members are predominantly people in their 20s and 30s, and also include leading Conservative politicians. A major influence on Conservative party policy for many years, the group is again attracting notice as a source of fresh ideas on public services, welfare, the condition of inner cities and crime policy. 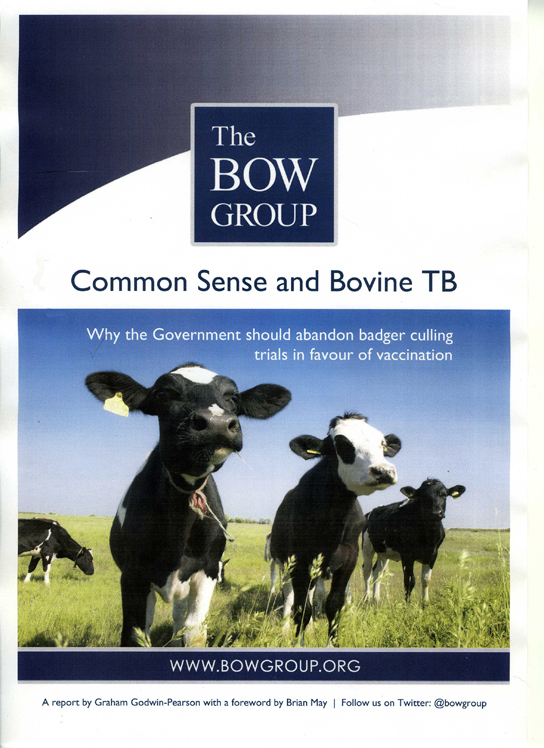 The Bow Group has published two reports concerning the Badger Cull and bTB. You can read the Executive summaries for both on this page; each full report is available for download at the end of the summaries. A report from The Bow Group published on 25 March 2012. The Government is choosing the wrong method for tackling bovine Tuberculosis (bTB) in England. Recent, large badger culling trials (11,000 badgers) have demonstrated projected efficiency in reducing bTB in cattle of just 12-16% (depending on the model) over 9 years. Badger culling has been demonstrated to lead to perturbation - a social fracturing that actually helps to spread bTB outside the affected area. 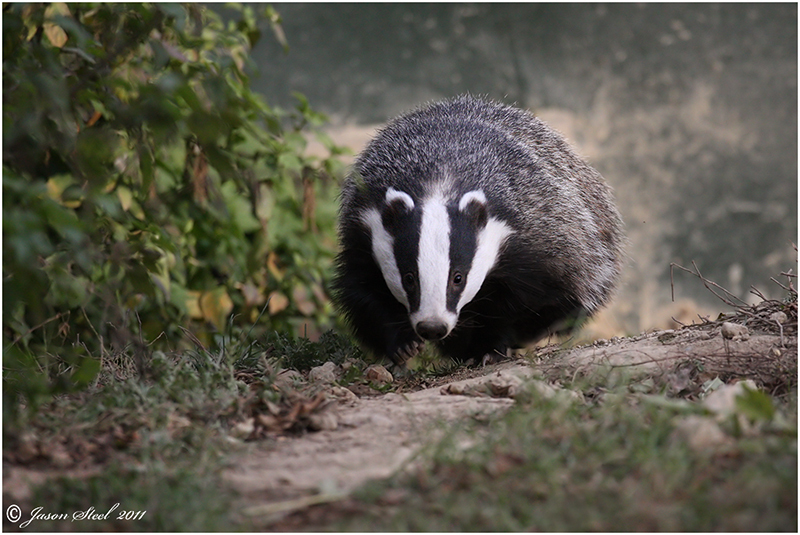 In contrast, trials of vaccinating a proportion of the wild badger population with BadgerBCG has shown to reduce the incidence of positive serological TB test results by almost 74%. Just 15% of badgers carry bTB and poor biosecurity likely plays a much bigger role in the spread of bTB. Serious lapses, whereby landowners have been re-tagging and transporting infected cattle, are of deep concern. Compensation payouts for bTB should be linked to fulfilment of biosecurity best practice. Simple, cost effective measures are available to physically separate badgers from cattle and can reduce the incidence of infection. The population of foxes is likely to increase in areas where badgers are culled, leading to additional problems for farmers. Foxes also impact adversely on a number of species, including hares, a UK BAP species in decline. Badger culling is likely to be more expensive than the Government would hope, when additional policing, the resulting spread of bTB and the delay to research of other, more effective methods of reducing the disease are taken into account. Badger culling is deeply unpopular, with The Bow Groupʼs own, independent market research confirming that 81% of people are opposed to the Governmentʼs plans. The architect of the Randomised Badger Culling Trial (RBCT), Lord Krebs, is also opposed to further culls, as are many leading scientists, conservationists, wildlife experts, the media and celebrities. The Government should establish a working group on vaccination and invest in this method of reducing infection in the wild badger population. The report is a 6.5MB download so, for convenience, it is zipped. It is quicker to download this way; then you will have the option to open or save the pdf file to your PC (recommended). This 2012 report has been downloaded times. 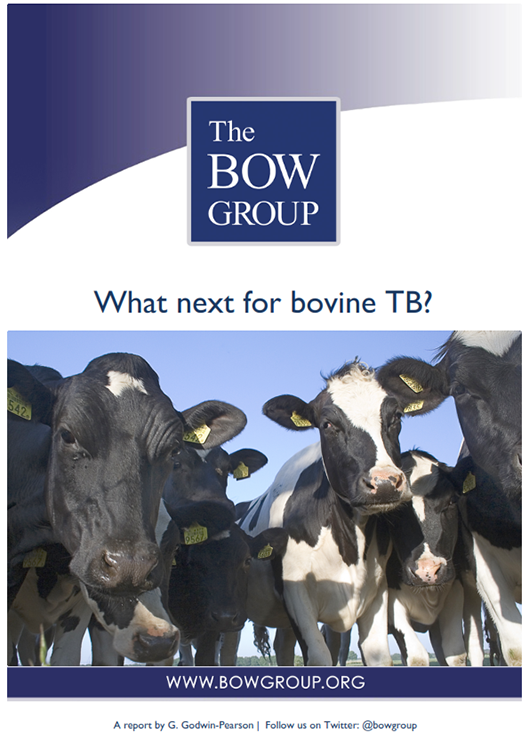 A report from The Bow Group published on 28 February 2014. Work with conservation charities to rollout a national injectable BCG badger vaccination programme, as per the recommendation of the EFRA Select Committee. Implement compulsory pre-movement testing between farms within the same holding and prior to agricultural shows and common land grazing. Compel farms that have TB to declare their status to neighbouring holdings. Enforce isolation regulations and slaughter any new-born calves of reactors. Increase the use of the g-IFN test, alongside the SICCT test. Take the lead, alongside a major commercial herd, in field trials of a cattle vaccine, in order to aid the progression of legislation to permit the license of cattle BCG in Europe and trading of vaccinated cattle. Appoint an Independent Panel on bTB to advise the Government on bTB policy direction now and in the future. Push for more intuitive agricultural subsidies from the EU which incentivises good management rather than simply encouraging high yields. If you would like to share the above summary on social media etc., then please click here to download the two-page document (pdf format). This 2014 summary has been downloaded times. The full report is a 8.5MB download so, for convenience, it is zipped. It is quicker to download this way; then you will have the option to open or save the pdf file to your PC (recommended). This 2014 report has been downloaded times.